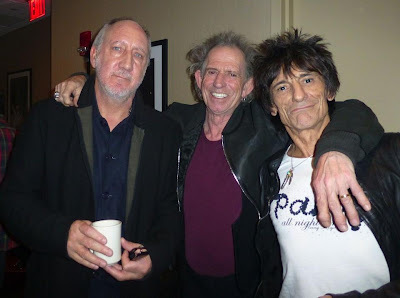 The Rolling Stones recently joined an all-star cast to perform at the 12-12-12 Sandy Relief concert in New York. The live event at Madison Square Garden featured a line-up that included Bon Jovi, Eric Clapton, Dave Grohl, Billy Joel, Alicia Keys, Bruce Springsteen & the E Street Band, Eddie Vedder, Roger Waters, Kanye West, The Who and Paul McCartney. Keith Richards is now sharing a backstage shot of himself hanging out with fellow Stone Ronnie Wood and Pete Townshend of The Who. All proceeds from the “12-12-12” event benefit the Robin Hood Relief Fund, which provides money, material and know-how to local organizations that are serving families and individuals in the regions hardest hit by the storm. The Stones recently wrapped up their 50 & Counting tour, which featured a series of five shows split between London, New York and New Jersey.